Sayulita ATV Tour from Puerto Vallarta - Surfing Lessons Too! 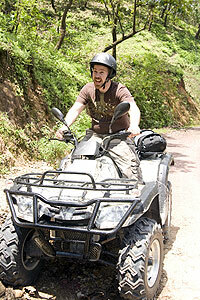 Leave Puerto Vallarta far behind, and join us on an ATV tour of the beautiful North Coast of Banderas Bay. Lush tropical jungle and beautiful blue water are our constant companions as we make our way to the quaint fishing village and legendary surfing mecca of Sayulita. No visit to Sayulita would be complete without trying your hand at surfing! Once we arrive at the village, your friendly and knowledgeable surfing instructor will show you how this age-old tradition is done. You can enjoy the exclusive beach nestled in the gentle palm-lined bay. Sayulita is the perfect place for a fun vacation whether it is for a family, a couple, or a group of friends. There are a variety of activities Sayulita has to offer that will make you come back with a sun-kissed tan and one of the most exotic and unforgettable travel memories of your life. See also our Sayulita Scooter Tour. Runs: Tuesday through Sunday from 9:30AM to 4:30PM. Old Clothes (not new) - You will get dirty! Long Pants recommended for protection. Cash for tip at restaurant or extra drinks. Departs From: ATV offices in Puerto Vallarta. Directions will be provided with your confirmation. Kids: Drivers must have a valid drivers license. There is no age limit for shared riders. Parents must sign a waiver. Kids under 10 years old are free. Kids 10 years and older are the same price as adults. Ship Price 1st Solo Rider Additional Solo ATVs You Save!